Aetiology Pcrsistcncc of bactcrial plaque. Progression of inflammation with tissue destruction is a common but not invariable sequel to chronic gingivitis; there is wide individual variation for unknown reasons. Microbiology Many potent pathogens (e.g. Porphyromonas species, and immunobgy capnocytophaga, Clostridia, fusobacteria, etc.) can be isolated from periodontal pockets, but individual roles in tissue destruction are uncertain. Some (e.g. Actinomyces species) produce bone resorbing factors. A defensive immune response (antibody production and cellular immunity) to plaque bacteria is detectable. Evidence of immunologically mediated tissue destruction is speculative only and not consistent with histological findings. Periodontal destruction is accelerated in immunodeficient patients but host factors affecting prognosis of periodontal disease have not been identified in otherwise healthy persons. Microscopy 1. Plaque and often calculus on tooth surface extending into pockets (Figs 37 & 38). 2. Predominantly lymphoplasmacytic infiltrate of gingival margin and pocket walls, not extending more deeply and not involving alveolar bone (Figs 38 & 39). 3. Rootward migration of epithelial attachment (Fig. 40). 4. Destruction of periodontal ligament fibres and alveolar bone, but osteoclasts rarely seen. 5. 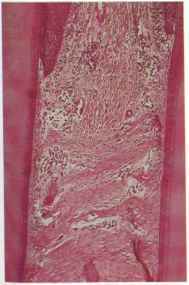 Formation of epithelium-lined pockets with epithelial attachment in floor. Gradual rootward progress of destruction leads eventually to loosening of teeth. Tissue destruction is usually uniform along the arch (horizontal bone loss) but local factors may promote more complex patterns of destruction. 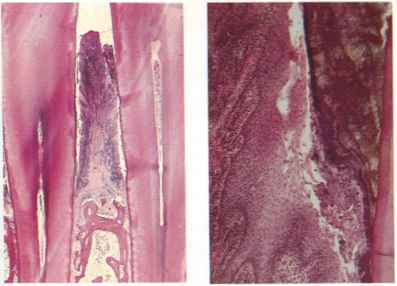 Localized destruction of bone around individual teeth (vertical bone loss) may develop or, occasionally, there is a more rapid destruction of periodontal ligament than alveolar bone with extension of pocketing between teeth and bone (intrabony pocketing). Rg. 38 Periodontal pocket: plaque and calculus, and epithelial lining. Rg. 37 Chronic periodontitis. Note inflammatory infiltrate locafizad to vicinity of plaque. fig. 39 Chronic periodontitis: inflammation-free zone between floor of pocket and bony crest. 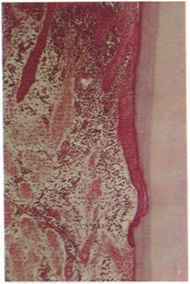 fig 40 Migration of epithelial attachment along cementum.